HONOLULU (APRIL 4, 2019) — Chaminade University received an anonymous challenge gift of $100,000 to support the new Silversword Training Center and Locker Rooms facility. The challenge gift was given to the university to galvanize interest and financial support for the first newly constructed building on Chaminade’s campus since 2012. The Silversword Athletics Training Center and Locker Rooms facility was completed in March 2019. Its state-of-the-art locker rooms will include four locker rooms (two men’s and two women’s), a sports medicine room and a team film room, and it will have the capacity to host conference tournaments. It will be the first facility of its kind at the university, ensuring the sustainability and progress of the Silversword Athletics program. To learn more about how to make a matching gift in support of the Silversword Athletics Training Center and Locker Rooms, contact Diane Peters-Nguyen, vice president of the Office of Advancement at Chaminade, at (808) 735-4772 or email dpeters@chaminade.edu. This gift is in support of the Bridges to the Future campaign, Chaminade’s most ambitious fundraising effort to date—raising $100 million by December 2018 to bridge past successes with future initiatives. The Bridges campaign supports students of the university in the following four ways: ensuring student access and support, advancing academic progress, building a richer campus life and renewing athletic traditions. Chaminade University of Honolulu provides a collaborative and innovative learning environment that prepares graduate and undergraduate students for life, service and successful careers. Established in 1955, the university is guided by its Catholic, Marianist aid package and liberal arts educational traditions, which include a commitment to serving the Native Hawaiian population. Chaminade offers an inclusive setting where students, faculty and staff collectively pursue a more just and peaceful society. HONOLULU, HAWAII (March 18, 2019) – After extensive investigation and collaboration, Chaminade University of Honolulu and the Hawaii School of Professional Psychology today announced it will continue to offer a PsyD program. The program was formerly hosted by Argosy University, which closed its doors and permanently suspended classes and programs earlier this month. The only program of its kind in Hawaii, the PsyD is a five-year program that culminates in a professional doctorate in psychology degree preparing graduates for practice in psychotherapy and psychological testing. The program is home to approximately 100 students and faculty members, all of whom will be welcomed at Chaminade. Chaminade University of Honolulu provides a collaborative and innovative learning environment that prepares graduate and undergraduate students for life, service and successful careers. Established in 1955, the university is guided by its Catholic, Marianist and liberal arts educational traditions, which include a commitment to serving the Native Hawaiian population. Chaminade offers an inclusive setting where students, faculty and staff collectively pursue a more just and peaceful society. HONOLULU (March 12, 2019) — Chaminade University alumnus Matthew Howard ’89, a general partner of Norwest Venture Partners, and wife Kelli Omura Howard, have gifted $25,000 to Chaminade’s new Data Science Program. With lead funding provided by the National Science Foundation, the Data Science Program is the first of its kind in Hawaii and is set to welcome its first freshman class this fall. 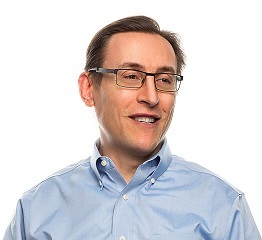 Howard received his BBA in Business, with an emphasis in information science, from Chaminade University in 1989, and has been member of Chaminade’s Board of Governors since 2014. He has over 30 years of experience in marketing, product management, engineering, business development, and sales in a wide range of technologies. Students in the Data Science Program will collaborate directly with industry partners to gain real-world experience and build networks. They’ll work with businesses and organizations for a semester-long capstone project and engage in a variety of hands-on internships. Students will learn using new fully-equipped cyberinfrastructure created specifically for this new program, including a new data science center and virtual reality classrooms. To learn more about the new data science, analytics and visualization major at Chaminade University, visit chaminade.edu. HONOLULU (March 11, 2019) – Chaminade University has named Dr. Lance Askildson as its new Provost, effective July 1, 2019. He will serve as Chaminade’s chief academic officer, cultivating and supporting a world-class faculty of teaching scholars while developing and promoting the University’s academic mission and vision. He will replace Dr. Helen Whippy, who is set to retire. Dr. Askildson comes to Chaminade with more than 15 years of distinctive higher education experience across three institutions. He most recently served as Vice Provost & Chief International Officer at Kennesaw State University, where he also holds a tenured faculty appointment in Applied Linguistics. Prior to that, he served as Assistant Provost and Founding Director of the Center for the Study of Languages & Cultures at the University of Notre Dame. He also previously served as an academic administrator and faculty member in the College of Humanities at the University of Arizona. An interdisciplinary scholar of second language acquisition, language learning technology and international studies, Dr. Askildson has been widely published in academic journals. 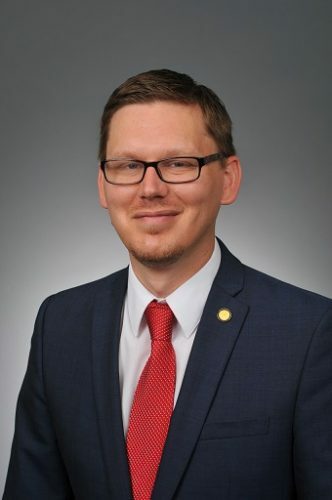 He is also a frequent invited speaker and consultant on the internationalization of higher education, language program assessment and leadership. Active in academic and professional organizations, Dr. Askildson is the former Executive Secretary of the International Association for Language Learning Technology; the current chair of the United Nations Institute for Training & Research regional training center in Atlanta; a trustee and board member of the Center for the Advanced Study of International Education; and an advisory board member of the federally funded Title VI National Foreign Language Resource Center on Language Assessment & Evaluation based at Georgetown University. Chaminade University of Honolulu provides a collaborative and innovative learning environment that prepares graduate and undergraduate students for life, service and successful careers. Established in 1955, the university is guided by its Catholic, Marianist and liberal arts educational traditions, which include a commitment to serving the Native Hawaiian population. Chaminade offers an inclusive setting where students, faculty and staff collectively pursue a more just and peaceful society. For more information, visit www.chaminade.edu. 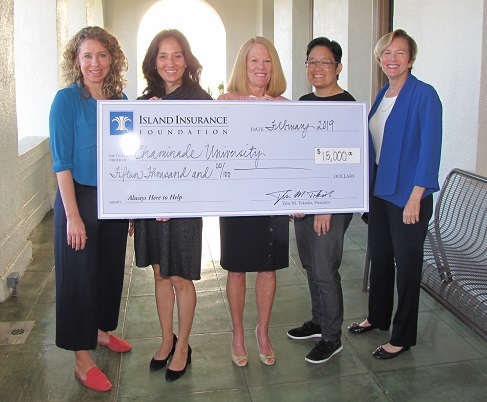 HONOLULU – The Island Insurance Foundation, the charitable arm of Island Insurance, a subsidiary of Island Holdings, Inc., donated $15,000 to Chaminade University towards renovations and upgrades of its science labs and office space for science faculty. Over the past decade, Chaminade has transformed its Division of Natural Science and Mathematics programs with improvements like adding new lab facilities, faculty and research staff, and revamping the undergraduate STEM (Science, Technology, Engineering and Math) curriculum. As a result of these positive changes, Chaminade’s Forensic Sciences program was nationally recognized in 2018 and its School of Nursing program was recently tied for first in the nation by the National Council of State Boards of Nursing based on the number of graduates who passed the National Council of Licensure Examination (NCLEX). The Island Insurance Foundation was established as the charitable arm of Island Insurance, Hawaii’s largest locally-owned and managed property and casualty insurance carrier, offering a full range of property and casualty protection. Established in 1940, Island Insurance holds a financial strength rating of “A” by A.M. Best and is the only Hawaii-based company to be recognized as one of the Top 50 property & casualty insurance companies in the nation by the Ward Group for 11 consecutive years. For more information, visit its website at: www.islandinsurance.com. Chaminade University of Honolulu was awarded a $200,000 grant from the Albert T. & Wallace T. Teruya Foundation to name the Multipurpose Conference Room in the newly renovated Hale Hoaloha building on the University’s campus. 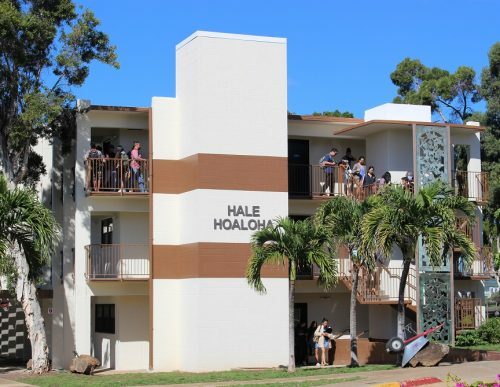 Formerly used as a residence hall, the three-story Hale Hoaloha was renovated to house the much-needed conference room as well as additional classrooms, the Center for Teaching and Learning (a professional development space for Chaminade faculty) and office space for Chaminade’s Criminology and Criminal Justice program. The 1,775 sq. ft. conference room is on the ground floor and opens to a garden. It is used for large classes, guest lectures, donor events, and internal and public workshops. ChaminadeUniversity of Honolulu provides a collaborative and innovative learning environment that prepares graduate and undergraduate students for life, service and successful careers. Established in 1955, the university is guided by its Catholic, Marianist aid package and liberal arts educational traditions, which include a commitment to serving the Native Hawaiian population. Chaminade offers an inclusive setting where students, faculty and staff collectively pursue a more just and peaceful society.